The AWS::Greengrass::Group resource represents a group in AWS IoT Greengrass. In the AWS IoT Greengrass API, groups are used to organize your group versions. Groups can reference multiple group versions. All group versions must be associated with a group. 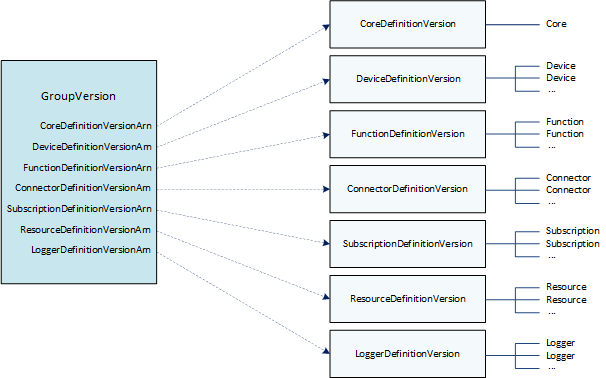 A group version references a device definition version, subscription definition version, and other version types that contain the components you want to deploy to a Greengrass core device. To deploy a group version, the group version must reference a core definition version that contains one core. Other version types are optionally included, depending on your business need. When you create a group, you can optionally include an initial group version. To associate a group version later, create a AWS::Greengrass::GroupVersion resource and specify the ID of this group. To change group components (such as devices, subscriptions, or functions), you must create new versions. This is because versions are immutable. For example, to add a function, you create a function definition version that contains the new function (and all other functions that you want to deploy). Then you create a group version that references the new function definition version (and all other version types that you want to deploy). After you create the group version in your AWS CloudFormation template, you can deploy it using the aws greengrass create-deployment command in the AWS CLI or by choosing Greengrass in the AWS IoT console. To deploy a group version, you must have a Greengrass service role associated with your AWS account. For more information, see AWS CloudFormation Support for AWS IoT Greengrass in the AWS IoT Greengrass Developer Guide. The group version to include when the group is created. A group version references the Amazon Resource Name (ARN) of a core definition version, device definition version, subscription definition version, and other version types. To associate a group version after the group is created, create an AWS::Greengrass::GroupVersion resource and specify the ID of this group. The ARN of the IAM role attached to the group. This role contains the permissions that Lambda functions and connectors use to interact with other AWS services. When you pass the logical ID of an AWS::Greengrass::Group resource to the intrinsic Ref function, the function returns the ID of the group, such as 1234a5b6-78cd-901e-2fgh-3i45j6k178l9. The time (in milliseconds since the epoch) when the group role was attached to the Group. The ARN of the last GroupVersion that was added to the Group, such as arn:aws:greengrass:us-east-1:123456789012:/greengrass/definition/groups/1234a5b6-78cd-901e-2fgh-3i45j6k178l9/versions/9876ac30-4bdb-4f9d-95af-b5fdb66be1a2. The ID of the Group, such as 1234a5b6-78cd-901e-2fgh-3i45j6k178l9. The ARN of the Group, such as arn:aws:greengrass:us-east-1:123456789012:/greengrass/definition/groups/1234a5b6-78cd-901e-2fgh-3i45j6k178l9. The ARN of the IAM role that's attached to the Group, such as arn:aws:iam::123456789012:role/role-name. The name of the Group, such as MyGroup. The template defines a core, device, function, logger, subscription, and two resources, and then references them from the group version. The template includes parameters that let you specify the certificate ARNs for the core and device and the ARN of the source Lambda function (which is an AWS Lambda resource). It uses the Ref and GetAtt intrinsic functions to reference IDs, ARNs, and other attributes that are required to create Greengrass resources.